Rebecca Kay secured a five stroke victory over New Zealand’s Caryn Khoo and Victoria’s Jessica Pickwick to claim the Women’s Riversdale Cup in Melbourne. 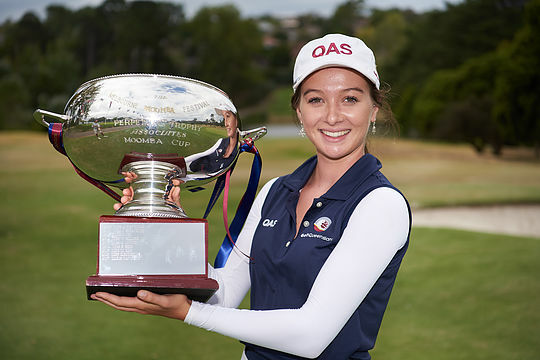 Kay fired rounds of 72-74-74-75 to finish at 3-over to add another national ranking title to her resume after recently collecting the SA Amateur Classic and the Queensland Amateur stroke play titles. Starting the final round with a clear lead over the field, Kay produced some stunning golf during the opening nine making the turn at even par to keep her distance from her nearest rivals. By the back nine, her rivals were effectively playing for second place and Kay ensured a string of pars over the closing holes would deliver the victory. “Like it was super tough out there today,” said Kay. Kay’s ball striking was simply impressive and she packs a punch when it comes to distance off the tee. Riversdale is not an overly long layout for the women and whilst Kay certainly had length off the tee advantage, she also produced an impressive display of mid-iron ball striking and clutch putting. “I’ve learnt a lot from all my experiences in playing pro tournaments,” said Kay. Kay often engages the services of her father, Scott, to carry the bag in the bigger events and the duo were together at Riversdale. “I hit a lot of fairways this week at Riversdale,” said Kay. Kay’s immediate plans are to focus on a number of world amateur tournaments in the UK and US, with the objective to secure a world ranking event. Victorian’s Aliza Hetherington and Alice Fan rounded out the top-5 placings.